5/ Removing the subsidies in King vs Burwell would simply be punishing low inc. people on basis of geography. Is that what @mfcannon wants? Ever since its controversial passage in 2010, the Affordable Care Act has been plastered with a range of polemic labels. Critics say Obamacare is job-killing; supporters herald it as life-saving. Here’s another, perhaps unexpected label: personally profitable. If you were among the true believers in the law a year ago today, there was easy money to be made. Nearly 80% of bettors on InTrade expected the law to be found unconstitutional; strategically spending about $25 in favor of the ACA could’ve netted you $800, based on how InTrade’s short-selling rules worked. Here’s a look at how the Supreme Court’s decision on June 28, 2012, affected five hot-button issues related to the health law. As of June 27, 2012: Several states with progressive governors and legislatures, like California, had moved to expand Medicaid ahead of the Supreme Court’s ruling. The Golden State’s leaders also had pledged to pursue universal coverage if the ACA was ruled unconstitutional. But most states were waiting on the resolution of the constitutionality battle. 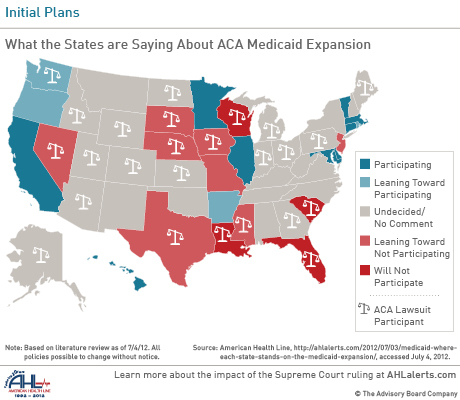 Since June 28, 2012: After the Court’s decision that the mandate was constitutional but that the Medicaid expansion was optional for states — which “took everyone by surprise,” said Matt Salo, executive director of the National Association of Medical Directors — governors were suddenly forced to decide whether the expansion made financial, and political, sense. Within a week, about ten states had signaled they’d expand Medicaid under the ACA. However, many wary governors chose to wait for the November elections, and the knowledge of who would hold the White House, before announcing their plans; following President Obama’s reelection, a flurry of governors clarified their Medicaid stances throughout the winter and spring. I am an emergency room physician who has worked at Atlanta’s Grady Memorial Hospital for 17 years. I am also the first black woman to ever be hired as a faculty member, and thus have had the opportunity to teach students and doctors in training. Given that 85% of the patients of the 120,000 patients that cross our threshold annually are black, my hiring carried enormous symbolic weight. Beyond the symbolism, I’ve found a real effect on patient care. There are a few earlier studies which suggest that patients prefer doctors who look like them if given the opportunity. Though we can’t yet confirm that physicians and patients of the same race improve health for minorities , we can still argue that increasing diversity in the healthcare professions is a worthy goal. We must move to a place where physicians can comfortably care for people of all cultures and patients can feel comfortable being cared for physicians from different cultures. In my own experience, African-American grandmothers, mothers, sisters, aunts all want to give me a hug when they see me walk in the room to treat them or their loved ones: “Go ahead sister,” they might say, “we’re so glad and proud to see you”. I have also had many black patients tell me they were more comfortable talking with me about their history of abuse or addiction. That kind of rapport leads to better care and a healthier population. If the Supreme Court had ruled in favor of Abigail Fisher in Fisher vs. The University of Texas today, which they did not, opportunities for physicians of color who could establish that rapport might have been significantly diminished. To eliminate or significantly weaken affirmative action, which would have been the result of a Fisher victory, would deal a significant blow to the ability of undergraduate programs to recruit and create a diverse student population—some of whom will continue on to medical school. To be sure, that blow would weaken medical schools nationwide. Now that the healthcare industry can work with clarity on care coordination strategies and programs, a new expansion of ACO models, trends in patient behavior and the companion issue of provider scope of practice have quickly emerged as critically-relevant spotlights. Historical perspective helps. Simply put, even with the political tumult this fall, there is strong bipartisan support for aligning payment and care delivery models with improving quality to create a smarter and sustainable healthcare system, backed by historical precedent. For me and my colleagues in the trenches of pursuing fiscally sound care delivery nearly a decade ago, it is well remembered that the origins of accountable care reside within a 2004 HHS document entitled “The Decade of Health Information Technology: Delivering Consumer-centric and Information-rich Health Care.” This “Framework for Strategic Action” (as it is also known) was delivered to then-HHS Secretary and GOP-appointee Tommy Thompson. And it was delivered by the nation’s first National Coordinator for Health Information Technology, Dr. David Brailer. The document’s goals of introducing health IT solutions to clinical practices, electronically connecting clinicians, using “information tools” to personalize care and advance population health reporting followed an executive order calling for widespread adoption of interoperable EHRs within 10 years. 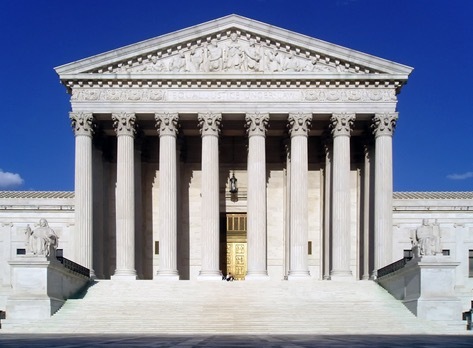 What Will the Supreme Court Decision Mean For the November Election? Will Republicans suceed in turning defeat into victory? Sarah Palin is convinced that they will. On her Facebook page, she celebrated: “Thank you, SCOTUS. This Obamacare ruling fires up the troops as America’s eyes are opened.” Palin, like Republican leader Mitch McConnell, believed that the Court’s ruling would galvanize Republic voters, sealing Romney’s victory in November. Now that the Supreme Court has spoken and upheld the Affordable Care Act (ACA), how exactly does this impact state governments? One of the biggest ramifications of this decision revolves around the ACA’s individual mandate requiring citizens to purchase some form of health insurance or face a penalty, and the subsequent requirement for each state to establish a health insurance exchange (HIX). While many states have spent the last two years preparing themselves in some capacity to set up an exchange, the amount of progress made varies greatly from state to state. Some have taken measureable strides to ensure their exchange is up and running to meet the October 2013 enrollments and January 2014 coverage effective deadlines set forth by the ACA, while others have been waiting on the final decision from the Court. Now that it’s been made, we’re going to see these states in a scramble to build their HIXs in accordance with the ACA’s mandates and timeline. What we’re hearing from our clients indicates the majority want to make health reform as state-specific as possible. In other words, they want to maintain control over their HIX rather than defaulting to the federal solution. But as the certification deadline looms, it’s increasingly important for states to consider a comprehensive solution that doesn’t require building a product and allows time for customization. We have formally announced our Health Insurance Exchange solution, which enables us to provide a customizable HIX solution that states can tailor to meet the needs of their residents and small businesses and be sure it’s ready on time. We were recently awarded an ACA-compliant exchange in Nevada and also announced a partnership with Florida Health Choices to build Florida’s insurance marketplace.